Did you know that more than 50 million Americans have food allergies and often just trace amounts of allergens can trigger life-threatening reactions? Read how researchers are developing a miniature lab that fits on your keychain and can accurately test for allergens, like gluten or nuts, in a restaurant meal in less than 10 minutes. Did you know that cancer cells hijack parts of the body’s immune system to prevent them from being destroyed? Read how researchers are working to develop a vaccine that boosts the immune system to treat cancer. 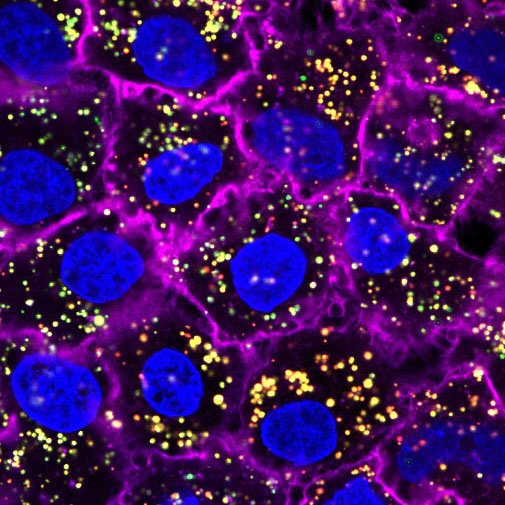 Yellow-colored nanoparticles target and enter cancer cells. Did you know that the use of nanoparticles dates back to 9th century Mesopotamia when artisans used them to generate a glittering effect on the surface of pots? Now, nanoparticles are being tested as a way to precisely deliver medications to tumors. Read about a new type of nanoparticle that can deliver multiple medications at once. English naturalist, Robert Hooke, drew one of first objects viewed through a microscope. He published his flea illustration some 350 years ago, drawn at 200-times magnification and covered in spiny bristles. Today, super-resolution fluorescence microscopy reveals the molecules within an organism, whether a flea or a human. Molecules are measured in nanometers; flea-sized is huge by comparison. How small is a nanometer? Take one strand of human hair and slice it 100,000 times. Each slice is approximately 1 nanometer. Did you know that most artificial hearts do not pump like the human heart? Instead, the most common device used to help people with failing hearts are more like jet engines that spin at speeds as high as 12,000 revolutions per minute and make a whirring sound instead of a heartbeat. Known as vascular assist devices or VADs, these remarkable rotors are now allowing almost 100,000 Americans with severe heart failure to live near normal lives as they quietly and efficiently propel blood through the body. Did you know that researchers are finding new uses for silkworm fibers, from which silk fabric has been made for centuries? An NIBIB-funded laboratory uses the same secretion to make spongy surfaces for growing cells, dissolvable screws for fixing bones, and adhesive gels to patch tissues together. The heart beats on average 100,000 times a day and pumps nearly 2,000 gallons of blood! Tissue engineered human livers are being put into mice to help drug developers understand side effects and success rates before human trials. A compound extracted from scorpion venom and a novel imaging tool called a scanning fiber endoscope could help illuminate brain tumors during surgery. Robotics and lasers are being incorporated into surgical tools to help surgeons remove hard-to-reach brain tumors. A new polymer utilizes water evaporation and condensation to generate power. A new polymer utilizes water evaporation and condensation to generate power. MIT engineers have created a new synthetic polymer film that changes its shape when it absorbs water vapor.